Terrorist snipers fired at Israelis along the Gaza border over the past few days. UAV fires, hits them. 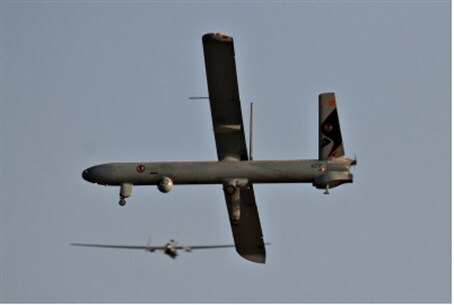 An IAF Unmanned Aerial Vehicle (UAV) fired at a squad of terrorist snipers in northern Gaza Monday. The squad was one of the terror cells that have been firing at Israelis in the past few days. On Sunday, the snipers fired at a farmer and later at an IDF force. The IDF identified hits on target. Voice of Israel radio cited Arab sources that said that a missile fired by the IAF hit Islamic Jihad terrorists on motorcycles near Beit Hanoun. Two of the terrorists were killed and several others were wounded. The radio report said that the snipers may have been trying to attack IDF forces that were involved in the incident near the border Monday. However, IDF sources said the UAV attack was unrelated to Monday's terror attack against builders of the security fence on the Israeli border.